What Should I Do If I’m Injured At Work? First thing is first, if the injury requires it, seek medical care immediately. Secondly, report the incident to a supervisor as soon as possible. It may be required to have a written account of the incident. All injuries that occur on the job should be recorded and reported. Though it will vary from state to state, there are some legal rights you can count on. You have the right to file a claim in workers compensation court. You have the right to see a medical professional and pursue any needed medical treatment. Once approved by a medical professional, you have the right to return to your job. If you are unable to return to work due to your injury, you have the right to disability compensation. And lastly, you have the right to a lawyer. If your injury is caused by the negligence of a third party, you may have the right to bring up a third party claim against the person or entity that caused your injury. How Do I File Workers’ Compensation Claim? Filing a workers’ compensation claim is not a lawsuit, but a request for benefits. Start by notifying your employer. They will be required to offer you a claim form. If for some reason they are not able to, you should contact your state Workers’ Compensation Office. Once the form has been filled out and the claim has been made, return the form to your employer. Your employer will not be able to give you any benefits until they have received the claim. Dealing with the aftermath of a car accident can be a pain. But outside of dealing with the headache of insurance and car repairs, if you are dealing with real physical pain, you may need medical attention. There are many symptoms to look for. These pains can manifest immediately or even weeks after a car wreck. 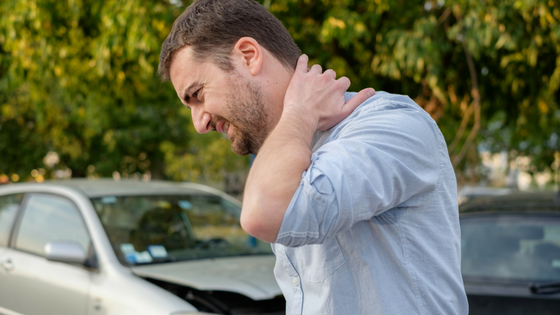 Stiffness and pain in the neck and shoulder are very common after a car accident. Often, they are a result of whiplash or the sudden movement that occurs in a wreck. Because your seatbelt wraps around one shoulder, that shoulder can take a significant amount of force. This can lead to bruising, discoloration, damage to tendons, and so on. 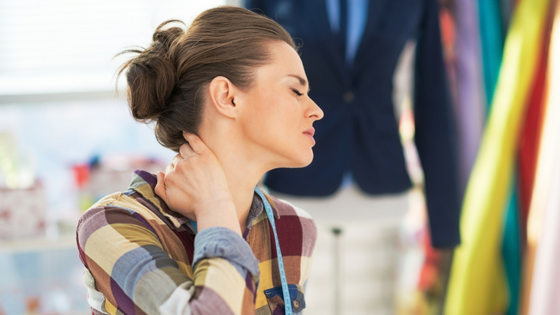 Neck and shoulder pain will not always appear immediately after an accident, these symptoms can be delayed up to a week. If you have shoulder and neck pain that lingers after an accident, you should see a medical professional to avoid any possible future pain or lasting effects. Headaches and dizziness—another common symptom of a car accident. These are usually signs of a concussion. Any sort of sudden jolt or bump can cause your brain to move in your skull which leads to a concussion. The seriousness of a concussion will vary based on severity, but because it is a brain injury it’s best to seek medical attention as soon as possible. Post-accident back pain can mean several things. You could just be bruised, but a herniated disc is also a possibility. Force from a collision can cause tissue between the vertebrae of the spine to rupture. A herniated disc can also cause numbness and loss of control of your muscles. Numbness and tingling anywhere on the body could mean a herniated disk. A stomach ache or abdominal swelling after an accident could mean internal injuries or internal bleeding. This is another symptom that can be delayed. If this symptom does occur, you may require emergency care. 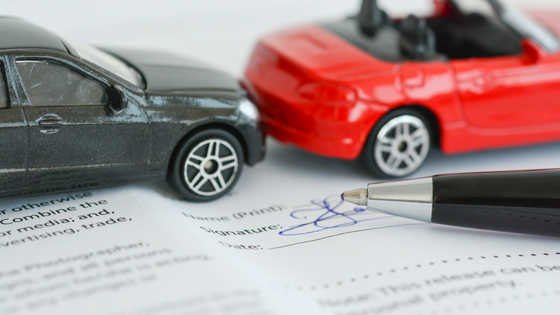 After you’ve been involved in an auto accident, it’s important to be sure you know what to do. You may you’ll know what to do, but at the moment you may be overwhelmed, confused, injured, or in shock. That’s why it’s important to know beforehand what to do after being in an accident. Here’s an auto accident checklist so that you can easily go through the list and keep yourself protected following an accident. After an accident, the first thing you want to do is attend to your safety and those involved. If anyone needs an ambulance or medical attention, be sure to call 911. If you and any other passengers and those in the other vehicle are safe, make sure you stay safe by moving out of the way of traffic or other hazards. If your cars are not in the way, you should leave them as they are so that the details of the accident can be recorded. Be sure you put your flashers on to alert other drivers. Whether it is a serious accident or not, it is a good idea to call the police. When they arrive on the scene, they will make a police report which can be helpful later on should you decide to work with a car accident law firm. As you give an account to police for the police report, be sure to include as much detail as possible. Be sure to stick to what you know; do not guess or assume. Be sure you make your own documentation as well for your records. Take pictures, write down information, speak to eye-witnesses, etc. Record the condition of your car, the other vehicle, the scene, and any other details that may have been involved in the accident. It is important to collect contact information from the other individual/individuals involved in the accident. If you contact the police, they will often gather this information for you. If they don’t, be sure you have it. This will be helpful in submitting insurance claims and determining fault if you take legal action. Sometimes injuries from auto accidents don’t manifest themselves until several days or even weeks following an auto accident. If you think you may have been injured it is important to get checked out. It is especially important to have documentation of injuries if you decide to hire a personal injury lawyer. Your injury lawyer will help you get your life back on track following an accident by fighting for you when it comes to dealing with insurance companies and settling legal disputes. If you are in the Taylorsville area and are looking for someone to fight in your corner for you following an auto accident or any other personal injury cases, contact Cockayne Law at (801) 268-2491. The attorneys at Cockayne Law proudly fight for Utah’s injury victims. Let them fight for you! It’s only natural to feel shaken after being in an auto accident. You may not be thinking clearly or may be injured and unable to follow the recommended procedure following an accident. Unfortunately, failing to follow an auto accident checklist correctly can result in losses should you decide to hire a personal injury lawyer to defend you. To help you avoid them, here are some of the mistakes you can make after an accident. Injuries from auto accidents don’t always manifest themselves immediately. You may be in an accident and feel fine, only to wake up the next day, week, or even month in severe pain. No matter what kind of accident you’re in and how serious it may or may not seem, be sure to report it. Without a report, it is harder to get insurance companies to take your claim seriously and it won’t look very good should your case go to court. It’s always a good idea to take photos of the scene following an auto accident. While that is good, most people take the wrong kind of photos to really be helpful in an auto accident case. When you take photos, you want to make sure you’re getting photos of the whole scene. Get wide angles from various distances. Move around and get different angles. Close-up photos are helpful too. Photos will be more helpful to you if you can get the full scene in the shot, especially if it had anything to do with the accident. Get photos of the scene from the direction each car was traveling. And be sure to get photos of the other driver’s license plate, insurance card, registration, and any damage to either vehicle. As previously mentioned, sometimes accidents may not seem like that big of a deal until you find yourself in pain later. If you’ve been involved in an accident and think you may be hurt, don’t be afraid to get medical attention immediately. Not only should you do this for your own well being, but if you wait insurance companies may use that against you. If you decide to hire a car accident law firm, waiting to get medical attention may hurt your case. The longer you wait, the better argument a defendant will have that your injuries just weren’t that serious. If you’ve been in and injured in an accident, it’s important to hire an accident attorney who can represent you and help you get back on your feet. If you’re in the Taylorsville area and are looking for a personal injury lawyer, contact Cockayne Law firm at (801)896-9306. The accident lawyers at Cockayne Law make it their mission to proudly fight for Utah’s injury victims. If you have ever had a puppy, you’ve probably felt those sharp puppy teeth on your skin a few more times than you’d like. It’s not usually a big deal; after all, the puppy will most likely outgrow this habit. If you do get a little scratch or gash it is easy enough to rinse the wound, clean it with hydrogen peroxide or rubbing alcohol, put on some topical antibiotic cream, and cover it with a bandage. But as dogs get older, their bites can become much more severe. 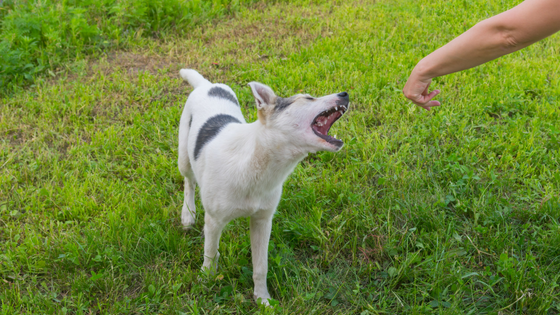 Dog bites can become very dangerous depending on the dog and the circumstances. If you’re around dogs or live in a neighborhood with dogs, it’s important to know what to do if you’re bitten. If you are involved in a dog attack or dog bite, you may be too shocked to think logically. Knowing what to do immediately after you have been bitten by a dog before it happens can help you to stay calm and take care of yourself as quickly as possible. The first thing you want to do if you’ve been bitten by a dog is to assess the situation. If you are bleeding profusely or the wound is on your head or neck, seek medical attention immediately. If you’re not in any life-threatening danger, don’t be afraid to let the wound bleed a little. This bleeding will help to flush out any bacteria the dog may have introduced. After about five minutes, try to stop the bleeding. If you aren’t able to do so, get medical help. If the dog that attacked you was not your dog, this is a good time to exchange information with the dog owner. Get their contact information as well as their insurance information. You’ll want to get vaccination records for their dog as well. During this process, do not discuss who is at fault. This is something that should be taken care of by a personal injury lawyer. Before you leave the scene, it is also a great idea to get the contact information of anyone that witnessed the biting. If you are bitten by a dog and there is no owner around, contact your local Animal Control immediately. You’ll then want to call 911 to get a rabies vaccination. Once the bleeding has stopped, you’ll want to wash the wound with soap and water. If you have antibiotic cream, apply this to the wound. Puncture wounds don’t typically need bandaging, but if you’re worried about keeping the injury clean or there is more damage done than just punctures, you’ll want to bandage the wound. Use a sterile bandage and keep it clean by changing it often. See a doctor if you think you may be in need of stitches. In some dog bite cases, you may need a personal injury lawyer to help with a pain and suffering lawsuit or personal injury lawsuit. If you’re wondering what will happen next, it is similar to the slip and fall lawsuit process. The first thing you need to do is hire a personal injury attorney, like the professionals at Cockayne Law. They can help answer your questions about what to do next, and inform you of the average personal injury settlements. After you’ve immediately taken care of your dog bite, give us a call at (801) 896-9306 so we can take of the remaining cleanup. Summer is the prime-time to hit the road with your family and check out that campground, amusement park, or beach you’ve always wanted to visit. July and August are some of the busiest months for travel which means there is more traffic, more distractions, and more accidents. Don’t let the dangers of these traveling months keep you from making new family memories. Here are the best tips to stay safe this summer during your summer road trips. Before heading out you want to make sure your car is in tip-top shape. Your battery will last about three to five years so if your battery is about that old, it may be a good idea to have it tested or replaced. You want to make sure your tires are ready for a long journey by making sure they are inflated to the correct pressure and have a good tire tread. The summer heat can be hard on your engine, so make sure the cooling system is working correctly. All fluids should be topped off and all lights should be working. Bring a spare key and replacement batteries so there’s no chance you’ll get locked out of your car. As you pack for your various summer activities, be sure you aren’t overloading your car. Your car has a weight restriction and you shouldn’t go beyond it. When you head out on your summer road trip you want to make sure you are comfortable so that you can stay focused on what really matters — the road. 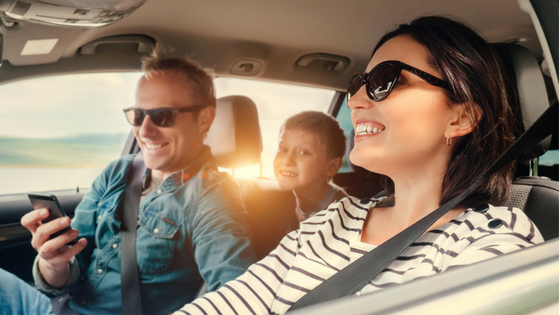 A pair of sunglasses aren’t just for looking cool; sun glare can be very hazardous so a pair of sunglasses can keep you safe during your summer road trip. Eat regular meals and stay hydrated. Bring a phone charger to make sure you can get help in an emergency. One way to stay safe is to prepare for stops and breakdowns. It’s a good idea to keep a few choice items on hand like your standard tools, a jump starter or jumper cables, and some road flares or reflective triangle for your car. It’s also a good idea to load up on some extra water before you head out so that you can stay well-hydrated no matter what situation you find yourself in. Extra food is also a great idea as well as a blanket, first aid kit, and a flashlight with extra batteries. If, despite your best efforts, you find yourself in an accident, it’s important to follow an auto accident checklist. If you’re unsure of what happens after a car accident, you can find printable auto accident checklists online. But even after filling out a police report and taking down the other driver’s information, you may still be unsure or unable to know how to deal with a car accident. If that’s the case, it’s important to find a find a personal injury lawyer that you can trust. Cockayne Law proudly fights for Utah injury victims. Give Cockayne Law a call for any of your injury case needs. If you’ve been in a situation and wonder if you need a lawyer, you may be unsure of how to proceed. 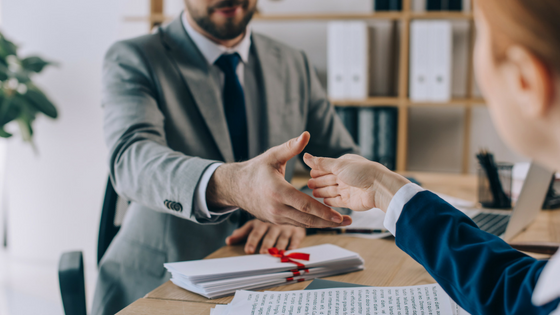 Knowing how to find the right attorney for you can be difficult, but there are a few things to keep in mind that will help you choose the right man or woman for the job. First, you’ll need to decide what type of attorney you need. What happened that has left you feeling like you are in need of a lawyer? Are you dealing with financial issues? Have you been involved in criminal activity? Or were you in an auto accident? Maybe you fell and have suffered injuries? If you are dealing with money issues you should look for a lawyer that specializes in bankruptcy law. If you have a run-in with the law you should hire a criminal law attorney. For auto accidents, you’ll want to find a good car accident law firm, and slip and fall cases require a slip and fall attorney. Once you’ve determined the right type of lawyer for your situation, you can continue on the path to finding the right attorney for you. One of the challenges many may find when looking for an attorney is whether or not they’ll find someone they can trust. One way to be sure you’ve found a qualified attorney is by contacting your local bar association. The State bar association will keep track of complaints and any disciplinary actions that may have been taken against licensed attorneys. This can give you peace of mind when you’ve narrow down your choice to a few options. If you know people who have recently settled personal injury claims, it’s a great idea to ask who their personal injury lawyer was. Ask friends, family members, and even friends of friends which lawyers they have used. Ask what they liked about them, what they didn’t like, and how their situation ended. This can be one of the most useful resources when finding an attorney. Whether you use some of the available online resources to find attorneys or read reviews about certain attorneys or check out a particular attorneys website, the internet can be a very helpful resource. A simple google search about someone you are considering to represent you can tell you a lot about an attorney! Once you think you’ve found the right lawyer, take the time to visit their office and schedule an interview to meet them and discuss your case. Most reputable lawyers will offer free consultations so that you can both be sure that you are both right for the job. If you’re looking for a car accident lawyer to help solve your case, check out Cockayne Law. With a free consultation for both car accidents and other personal injury cases, you’ll be in good hands with the professionals at Cockayne Law. You don’t have to go to Youtube to watch auto accidents that are caused by texting and driving. As you drive down the road, simply look out your window. Chances are you’ll be able to spot someone who is driving distracted with a cell phone in their hand. Not only is texting and driving dangerous for the one using their phone, it makes the roads more dangerous for everyone else. The National Highway Traffic Safety Administration reported that distracted driving claimed nearly 3,500 lives in 2015. Of those distractions, they say that texting is the most alarming. Distracted driving can be defined as taking your eyes off the road, taking your hands off the wheel, or taking your mind off of driving. The danger of cell phone usage while driving is that it involves all three types of distracted driving. It may not seem like you’re putting much in jeopardy by glancing down at your cell phone, but according to the NHTSA, taking your eyes off the road and looking at your phone for five seconds while going 55 mph means that you’re essentially driving the length of an entire football field with your eyes closed. 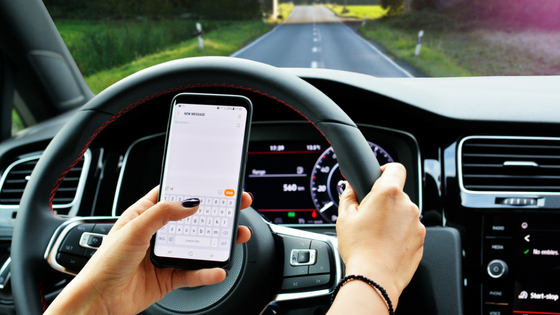 Whether you are distracted by a cell phone, changing the radio station, talking to a friend in the passenger seat, or eating while driving, you are putting yourself and others at major risk unnecessarily. Don’t think distracted driving accidents happen very often? Think again. Every day in the U.S. nine people are killed, and more than 1,000 are injured in crashes involving a distracted driver, according to the CDC. Those who are more at risk for distraction-related deadly crashes are those under the age of 20. It just so happens that the CDC’s Youth Risk Behavior Surveillance System also reported that in 2015, 42 percent of high school students who drove in the past 30 days sent a text or email while driving. Those who reported frequent texting while driving were also less likely to wear a seatbelt, ride with someone who had been drinking, or were more likely to drink and drive themselves. These are just a few of the statistics on texting and driving. The bottom line is, it is dangerous. Stay safe and put your phone away while driving, and encourage others to do the same. 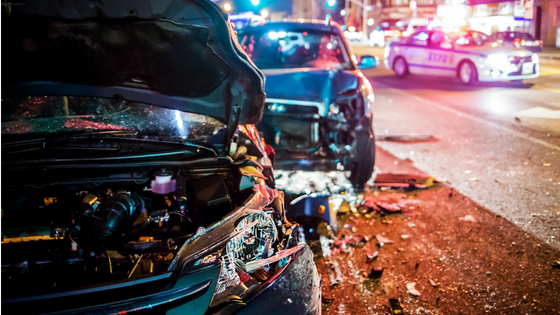 If you or someone you know has been in an auto accident, you probably have a lot of questions like, how to deal with a car accident, should you get a police report, and whether or not you need an accident lawyer. To help you avoid this panic and confusion, it is important to find a printable auto accident checklist and keep it in your vehicle at all times. Get familiar with resources like Geico for reporting an accident. Next, have a lawyer in mind that you can trust to help you navigate insurance companies, other drivers involved, and the law. Cockayne Law will fight for you no matter how big or small your case is. Contact them after an auto accident for your free consultation. Being in an auto accident is no fun. You have to remember what to do after a car accident, gather information from the other driver and about the accident, as well as think about hiring an auto accident attorney. This can all be much more of a headache if you’re dealing with an injury. Whiplash is one of the most common injuries associated with rear-end car collisions and can make life difficult to manage. Here’s how to treat whiplash. First, when a driver or passenger’s head moves backwards and forwards suddenly with a lot of force, the soft tissue in the neck extend beyond their regular range of motion. The rapid movement can damage the tendons and ligaments in the neck, causing them to stretch or tear. This is whiplash. Cases of whiplash can range from minor to more severe. The amount of pain and the time it takes to heal can also vary. Sometimes, the time it takes for whiplash symptoms to appear can also vary greatly. Because it may be up to a few days before you notice symptoms of whiplash, there are several symptoms you should watch for if you’ve been in an auto accident. If you have whiplash you may experience neck pain and stiffness, headaches (especially at the base of the skull), dizziness, blurred vision, or unrelenting weariness. If you notice these symptoms getting worse, or they seem to spread to your shoulders or arms, moving your head becomes painful, or you have numbness/weakness in your arms, see a doctor immediately. Once you’ve determined that you have whiplash, you can start with some at-home remedies. Ice your neck to help bring down any swelling you may be experiencing. Ice for 15 minutes every few hours and see how you feel after two or three days. If you are still experiencing pain after a few days of icing, you can try applying moist heat to your neck by using warm, wet towels or taking a warm bath. You can also take some anti-inflammatory pain medication. If the whiplash is more serious, you may need to see a doctor. The doctor may recommend wearing a neck brace to temporarily prevent movement and more injury to the neck. But a lack of movement can actually make whiplash worse in the long run. Physical therapy and specific exercises performed throughout the day may help improve whiplash. Remember, even a minor car accident or an accident with no damage can cause whiplash. If you’ve been in any type of accident it is important to pay special attention to your body in the days following the accident. As symptoms may come on after the fact, it is especially important to know how to deal with a car accident and to follow a car accident checklist. Trying to get compensation for medical bills after a car accident without a police report can be difficult. If you find yourself suffering from whiplash, be sure to contact a car accident lawyer. If you’re a Taylorsville resident and want the best of the best, choose Cockayne Law. They can help you work with insurance, police, and anyone else involved so that you can work on getting better. You’ve been told your whole life to “buckle up” after getting into a vehicle and before hitting the road. You likely heard it from your parents or other family members, and you have definitely heard it from local police officers and prominent leaders. If you’ve ever stopped to question whether using a seat belt is really necessary, you aren’t alone. Some find seat belts just downright uncomfortable! Fortunately, there has been plenty of information collected about car accidents at seat belt use to help you makeup your mind about seat belts. Here are a few seat belt statistics — the good and the bad. First off, the CDC reports that car accidents are the leading cause of death for those between the age one and 54 years old. In 2015, more than 22,000 people in vehicles died in car crashes. More than half of those who died were not using a seat belt. 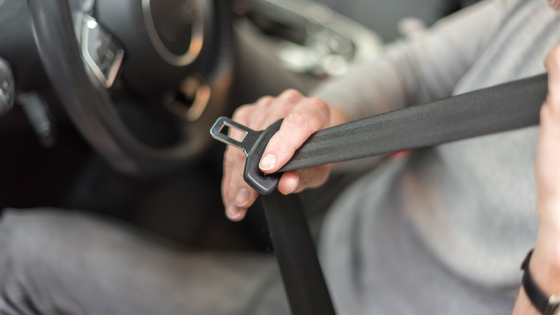 Studies have shown that when it comes to moderate-to-critical injuries, those who wear seat belts reduce their risk of injury by 50 percent. Fatal injuries are also reduced by 45 percent. Seat belts also work to keep passengers restrained in the vehicle, which is an important function as being ejected from a vehicle drastically increases the odds of fatality. The NHTSA reports that in 2008, 77 percent of accidents reported in fatality when the occupant was ejected from the vehicle. So what about those who think seat belts are a waste of time? One argument is that wearing a seat belt may give drivers a sense of false safety, making them take risks they might not otherwise take. This would, in theory, increase likelihood of being involved in an accident. Drivers should know the risks of operating a vehicle when they get inside. Cars can be dangerous, whether you are buckled up or not. Just because you’re wearing a seat belt doesn’t mean you are invincible. Use a seat belt as an added safety measure, along with defensive driving skills and basic safety. In order to keep you safe, seat belts also need to be worn properly. When improperly used, they may do more harm than good. Be sure to sit properly in your vehicle’s seat, and make sure the seat belt fits you snugly and securely. The truth is, seat belts can reduce serious crash-related injuries and death by about half, according to the CDC. Seat belts save lives. In fact, the National Highway Traffic Safety Administration reports that since 1975, seat belts have saved nearly 300,000 lives! Use caution and use them correctly, but do use your seat belt. If you’ve been in an accident, whether a minor car accident or something more serious, follow your accident checklist and then contact your auto accident attorney. Don’t have one?